One-piece lucite easel stand that holds and displays various size card holders. CASE QUANTITY. 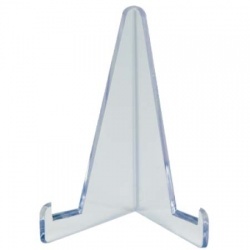 One-piece lucite easel stand that holds and displays various size card holders. CASE QUANTITY. One-piece lucite easel stand that holds and displays various larger sized collectibles. Why Mylar? Mylar is widely accepted as the best way to store and preserve paper-based collectibles. In fact, the U.S. Library of Congress uses only Mylar and other approved Polyester films to preserve their paper documents. Mylar will never yellow or put harmful materials into the item it is protecting. As an added benefit, Mylar has a superior brilliance and clarity that truly showcases your collection! Sleeve is open on both short ends and has a fold-over flap on one of the long ends (this is the design preferred by the Library of Congress). The item is completely covered, and the stiffness of the Mylar sleeve holds the item securely in place. 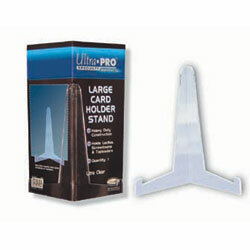 One-piece lucite easel stand that holds and displays various size card holders. Ideal for ONE-TOUCH holders, screwdowns and toploaders. One-piece lucite easel stand that holds and displays various larger sized card, postcard and photo holders.